Climate change may or may not have helped generate the nor'easter lashing the East Coast this weekend. Such storms happen with some regularity, after all. But the amount of snow the storm called "Nemo" ultimately dumps, and the extent of flood damage it leaves in its wake, may well have ties to global warming, climate scientists suggested. Michael Mann, a climatologist who directs the Earth System Science Center at Pennsylvania State University, compared a major storm like Nemo -- or Hurricane Irene or Superstorm Sandy, for that matter -- to a basketball slam-dunk with a lower net. The two key ingredients in a big snow: just cold-enough temperatures and a lot of moisture. Combine the chilled air converging on the East with the massive moisture coming from the Gulf of Mexico region and you've got the "perfect setup for a big storm," Kevin Trenberth, of the Climate Analysis Section at the National Center for Atmospheric Research in Colorado, told The Huffington Post in an email. As Trenberth explained, the ideal temperature for a blizzard is just below freezing -- just cold enough to crystalize water into snow. Below that, the atmosphere's ability to hold moisture to create those snowflakes drops by 4 percent for every one degree Fahrenheit fall in temperature. "In the past, temperatures at this time of year would have been a lot below freezing," Trenberth said. In other words, it's been too cold to snow heavily. But that may become less of an obstacle for snow in the Northeast. In addition to warming the air, climate change is adding moisture to it. Sea surface temperatures are about two degrees Fahrenheit warmer than they were before 1980, raising the potential for a big snow by about 10 percent, according to Trenberth. And any individual storm, including this nor'easter, will pick up more moisture as it spins across a warmer ocean. What's more, as Mann explained, a warm ocean clashes with cold air masses from the Arctic. A bigger contrast in temperatures may mean a bigger storm, he said. Michael Oppenheimer, a climate change expert at Princeton University, said global warming is increasing extreme storms. "Storms like this tend to be heavier than they used to be," he told HuffPost. "That's a fact." 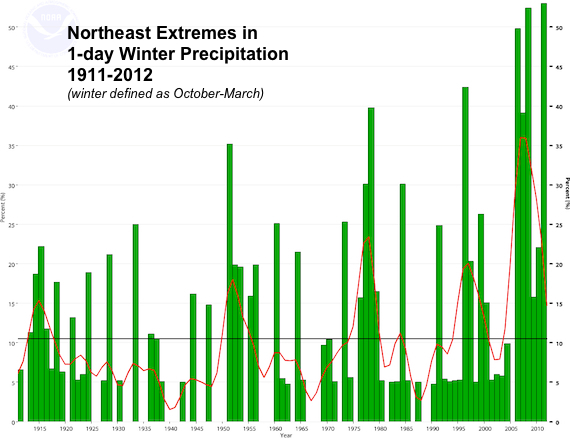 As HuffPost reported on Friday, National Oceanic and Atmospheric Administration records show that the Northeast saw a 74 percent increase in precipitation during the heaviest rain and snow events from 1958 to 2011. Still, connecting any specific weather event to global warming remains inexact. A new area of study called "event attribution science" is mining data in an attempt to make more definitive links, or at least better gauge the odds of an extreme event in the context of climate change that results partly from human activities, including burning fossil fuels. But the field is young. And, truth is, nor'easters happen. In fact, Jeff Masters, a climatologist and founder of Weather Underground, noted that the number of intense nor'easters hasn't increased over the last three or four decades. A warmer climate, he explained, can decrease the length of the snowy season, and therefore the time window for nor'easters. Further, nor'easters are defined not only by heavy snowfall, but by high winds. There's less evidence for links between winter winds and climate change. Warm weather storms, such as Hurricane Irene and Superstorm Sandy, are another story. "Since hurricanes are heat engines, they drive power from ocean waters," said Masters. Another climate-linked ingredient could propel this weekend's storm into the history books: rising sea levels. "A three-foot storm surge, on top of a higher sea level, will do more damage," Masters said, noting that sea levels in Boston, expected to bear the brunt of the nor'easter with an historic storm surge, have risen a foot in the last 90 years. Penn State's Mann also likes to use baseball metaphors when describing climate's influence on major storms -- "home runs," he calls them. "What we're seeing now with climate change is weather on steroids." CORRECTION: An earlier version of this story misidentified Kevin Trenberth's job title. The error has been corrected.